Would you rather drink green juice or bubble tea? Why not BOTH? The deliciousness of bubble tea meets the health benefits of green juice in this refreshing drink! Gluten-free, dairy-free, and nut-free with a vegan option. Bring 10 cups of water to a boil. When the water is at a rolling boil, slowly add the tapioca and stir gently. When the tapioca begins to float to the surface (about 1-2 minutes) reduce the heat to medium and cover with a tight fitting lid. Cook covered on mediumt heat for 2-3 more minutes (if you want softer tapioca, you can cook for 4-5 minutes). Prepare a bowl full of cold water. Make sure the bowl is large enough and the water is high enough to cover the tapioca balls completely. Scoop out the tapioca with a slotted spoon or carefully drain with a colander. Add to the bowl of cold water and allow to soak for 1 minute (this stops the cooking process so that your boba will be the right texture). Drain the cold water from the bowl reserving the tapioca pearls. Add honey and stir so that all the pearls are well-coated. Allow to sit for 10 minutes until the tapioca pearls have a sweet aftertaste. Feel free to let them sit slightly longer (5-10 minutes more) for a sweeter taste. Spoon tapioca pearls into the bottom of two glasses. Add green juice, a wide straw, and enjoy cold! I used quick cooking tapioca pearls for this recipe. I recommend you use the same brand of tapioca pearls I did (you can find it on Amazon here) so that you can use the same cooking method. Different brands and types of tapioca pearls will have different cooking times and water-to-tapioca ratios. If you use a different brand, follow the instructions on the package. This brand is also gluten-free (although I'm unsure about cross-contamination risk). I used raw honey for a little added nutrition, but feel free to use regular honey or brown sugar (for a vegan version). I recommend using 1-2 tablespoons of honey depending on how sweet you want the tapioca pearls to taste. Feel free to adjust the amount of honey based on your preferences. You can use any kind of green juice you want for this recipe. You can get it from your local juice bar, a natural foods store like Whole Foods, or you can make your own! I recommend kale, spinach, cucumber, celery, and just a little bit of apple (you don't want it to have too much sugar). I also like to mix bottled juices, so I can control the sweetness (i.e. mix a juice that has some apple in it with a juice that's just veggies so it's less sweet). You can also use other juices besides green, such as, carrot or beet to make difffent colored drinks. The possibilities are endless! 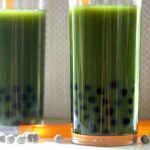 Although bubble tea is typically made with black or green tea, I omitted tea in this recipe because I didn't feel that tea and green juice mixed that well together. However, you're welcome to try adding some tea if you wish!